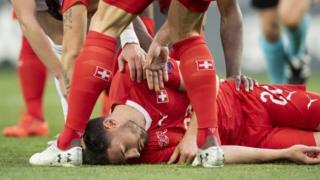 A Switzerland football player knocked out in an aerial clash in a Euro 2020 qualifier received emergency help from a member of rival team Georgia. Fabian Schaer’s head collided with the skull of Georgia’s Jemal Tabidze as both went for the ball in the 24th minute of the match in Tbilisi. Schaer lay unconscious on the ground, his tongue stuck down his throat. Georgian player Jano Ananidze rushed to his aid, inserting his hand in Schaer’s mouth to free the player’s tongue. Schaer recovered quickly after further treatment from Swiss first-aiders, Swiss daily Blick reports, and was able to continue playing, helping set up Switzerland’s second-half goals for their 2:0 victory. Tabidze also lay motionless after the clash, his shirt covered in blood, but he, too, recovered.